They are the names that one day will make up the bylines and help write the headlines in daily papers throughout the country and online websites. They are also the names that we will hear on the nightly news, and on the radio. On May 4, those names were read aloud as part of the Syracuse Press Club awards dinner. The Press Club annually awards excellent work, and SU students and staff are among the winners. These awards are determined by reporters from other news markets, which is a true peer review for people in the journalistic field. 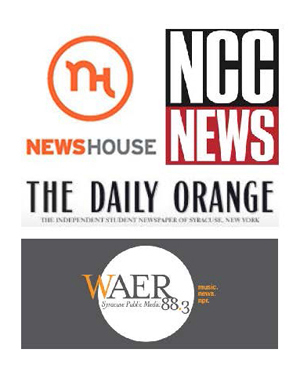 WAER-FM was also awarded a number of Press Club honors, including Jim Levulis for spot news coverage; John Smith for human interest feature; John Nolan and Chet Davis for sports stories; Chris Lewis, Gabe Altieri, Bill Spaulding, Andrew Kanel, Erik Duick and James Gloria for best sports shows; and John Smith and Scott Willis for best radio newscast.